"I just finished your book. BRILLIANT. Every dog owner needs this invaluable tool. It's concise, easy to understand and clearly sets out the requirements and protocols for a successful defense should the need arise to defend your dog at court." 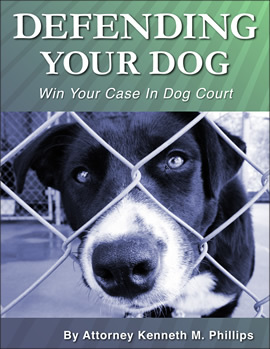 DEFENDING YOUR DOG - Win Your Case In Dog Court is an important, essential book for people who are facing charges in criminal court or dog court. The goal of the book is to help the owners of non-vicious dogs get justice. Quickly get up to speed about what you and your dog are being accused of, what the defenses are, and how to powerfully defend both of you. Don't count on getting justice if you're unprepared at court! Can anyone seriously say that every time a police officer writes a ticket or makes an arrest, he is always right? The answer is "no." Can anyone seriously say that every person accused of a crime is always guilty? The answer is "no." Well, the same applies to animal control citations by humane officers, dog wardens, and police. They are not always justified. And have you ever heard of cases where the punishment was too harsh -- where it did not "fit the crime"? A dog owner should not automatically get the maximum sentence. Nor should his dog. A sentence should be fair under all the circumstances. When you are caught up in the legal system, never count on justice coming effortlessly. In court, one side accuses and the other side defends. A judge listens to each and then makes his decision. If a party isn't prepared, he won't get fair treatment. Don't walk into court or dog court unprepared! There's too much at stake. Immediate download! Read the PDF on your Mac or PC. $19.95. Also available for the iPad at the iBookstore. Don't wait until it's too late! Get DEFENDING YOUR DOG - Win Your Case in Dog Court today. It's an immediate download. One more thing. If you are also being sued by the owner of an injured dog, and you are not legally liable for what happened, you will have to defend yourself in civil court. Unless you have homeowners or renters insurance that provides coverage, you can end up paying for something that wasn't your fault. To prevent that from happening, get a copy of When a Dog Is Injured Or Killed. Even though it is written from the standpoint of the "other guy," it outlines all of the defenses to dog-on-dog cases. It's easy to read, covers all you need to know, and is an instant download.